Dr. Richard Pohl is a Czech pianist and teacher. He is graduate of the State Conservatory Brno (prof. E. Horáková) and Janáček Academy of Music and Performing Arts in Brno (prof. Z. Hnát, prof. A. Vlasáková, doc. J. Jiraský). Also, he attended masterclasses by internationally recognized pianists (S. Vladar, J. Jiracek von Arnim, G. Kanev, S. Speidel, aj.). For his excellent doctoral research related to Leoš Janáček he was given the Premium Award by the Janáček Foundation (2016). Richard Pohl is currently associate professor of piano performance in China. Furthermore, he’s been named the president of the newly established branch of the World Piano Teachers Association WPTA in China – Jiangxi province. Pohl toured extensively in Czechia and other European countries, venturing even to further areas like USA, Mexico and China. He collaborated with many instrumentalists and singers. Since 2016 he has devoted his time to presenting Czech music projects in China with regular recitals, chamber events, lectures and masterclasses. Consequently, he lectured at the Sichuan Conservatory of Music in Chengdu. Pohl often collaborates with Czech embassies and consulates and in 2018 presented several events celebrating the 100th anniversary of Czechoslovakia. This includes piano recital during Czech Days in Guangzhou and further performances in Chengdu, Hangzhou and Shanghai. He often collaborates with the world-famous Czech piano company PETROF. Richard Pohl is a regular member of both national and international piano juries in China and writes articles related to piano music and teaching. 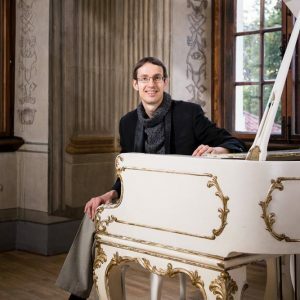 Richard Pohl received several prizes at music competitions, including Carl Ditters von Dittersdorf competition, Concertino Praga, Jazz competition in Jablonec and awards at the International Piano Courses Antonín Kubálek. During his doctoral research concerning the life and work of Czech pianist Rudolf Firkušný he received several extraordinary scholarships and even a national grant. He collaborated with important American institutions like The Juiliard School, Aspen Music Festival or the International Piano Archives. Consequently, his doctoral thesis was awarded by the Premium Prize of the Janáček Foundation and published in the premium editorial “Acta musicologica et tetralogica”. Similarly, his knowledge of Janáček and Czech music he further applies during his work in China. He is also holder of the Excellent Teacher’s Award by the Yamaha piano company. Richard Pohl’s first piano recital came at the age of six and at the age of nine he appeared on the screen of the Czech national television with his own compositions. Later he performed hundreds of concerts in Czechia and abroad. He recorded for broadcast and on CD. Pohl also participated in benefit events and supported young artists concert series. Recently he premiered several works of contemporary composers (including Enrico Chapela, Omar Rojas, Vlastimil Lejsek and Miloš Štědroň). Among Pohl’s great artistic passions are opera and art song. He served as piano collaborator in the masterclasses and performances of great opera artists like Peter Dvorský, Gabriela Beňačková, Brigitte Fassbaender, Eva Randová, Mario Zhang, Adam Plachetka or Xingxing Wang. Especially his song recitals along with bass-baritone Josef Škarka has been acclaimed by both public and professional critics. He also worked with some great instrumentalists, like the top Chinese clarinetist Wang Tao, top Chinese violinist Liu Yang, top Albanian cellist Bledar Zajmi and great Czech violinists Ivana Kovalčíková and Ivana Frajtová (Due in Eterno). With pianist Jiří Hrubý he created the Slavonic Piano Duo focusing on four hand piano music. In China he gives piano classes, but also lectures about methodology and Czech music culture. Most noteworthy, he gives Czech language tuition to gifted students, preparing them for further studies in Czechia and other European countries. Richard Pohl participated in many important music festivals in Czechia (Moravský podzim, Hudební slavnosti Vysočiny, Mezinárodní festival Petera Dvorského, etc.). Besides, he often collaborates with the multi genre festival ProArt as teacher and performer. That includes recitals, improvisations and musical arrangements of stage projects. He also coordinated many festivals with his own art agency MelodiaArt. The top projects included international collaborations with Mexico – festivals Janáček-Revueltas 2008 and Mexico 2010. In 2012 he took part in the festival 100th anniversary Rudolf Firkušný at the Janáček Academy of Music and Performing Arts. He served there as the assistant producer, translator and co-author of booklets. International guests included many world famous pianists, teachers and other personalities from various countries. Finally, he organized many festivals for promotion of young music talents, including students at JAMU. In China he participates in events organized by the Czech country’s embassy and consulates. His events are supported by famous piano brands, including the legendary Czech luxurius piano brand PETROF. Richard Pohl has been thoroughly studying methodology and didactics of the piano playing. His main inspiration was the teaching of the legendary Czech professor Alena Vlasáková. Pohl is particularly interested in historically informed interpretation and late romantic interpretation. He has been passionately collecting recordings and books related to piano in several languages. At the Janáček Academy he also lectured in the History of Piano Playing and Pedagogy and the History of Piano Interpretation. For these he created his own study materials. His additional teaching experience includes working at the Pavel Křížkovský Art High School and music schools in Brno and Žďár nad Sázavou. Richard Pohl’ students recevied first prizes at several music competitions. His masterclasses during the ProArt festival attended students from Czechia and China. Pohl is currently researching in the practical application of Central European piano traditions in the Chinese environment. Hence his students study Czech pieces, while the courses are taught in the Chinese language employing international piano methods. In his free time, Pohl is studying Chinese history, culture and literature. He lives in a quiet residence with his famous wife, the renowned Chinese soprano Xingxing Wang. He is fluent in five languages, including the standard Mandarin Chinese. In addition to music, he enjoys reading, travelling and fine arts. Richard Pohl is represented by the Shanghai Baohong Culture agency.